The Grandfather Clock Blog is my mini-journal about Grandfather Clocks. - lets you know when new Webpages appear on Grandfather Clock Info, telling about clock plans or information on clocks. - keeps you up-to-date with other postings news on grandfather clocks. 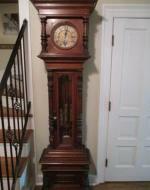 Continue reading "What is the age of my Grandmother Clock 1191"
I am looking to find out more about my clock. What I do know is that on the back of the brass clock works, the word (German) is etched into the plate. Continue reading "LOOKING FOR INFO on my Herschede Hall Clock"
Continue reading "My Ridgeway Van Ness Will Not Chime"
Continue reading "PLEASE HELP Inside of clock removed: Ridgway Grandfather Clock"
Continue reading "Hands stop moving"
I have the opportunity to purchase a Sligh Grandfather clock model #0825-1-AB. Do you have any idea of the value? They're asking 1200.00. Continue reading "Sligh Grandfathers Clock #0825-1-AB "
Continue reading "HELP! Colonial Model 1694 Question..."
Continue reading "1976 Howard Miller grandfather clock"
Just acquired a Herschede grandmother (Newton) Movement needs complete overhaul. Are repair manuals available or should I simply replace the movement? Continue reading "Daneker "Terry" Lost Pendulum"
Continue reading "Emperor Movements 100M"
Continue reading "Information needed on the Model 1724 Colonial of Zeeland"
Continue reading "Serial Number 90062340"
Continue reading "Please help me determine the age of my clock"
After raising the three weights using the key, cables are used to suspend the weights, the two outside weights don't move. Only the center weight drops. Continue reading "Clock will only strike once on the hour -- Trend Movement 124BL"
Continue reading "clock runs, but won't chime?" We are moving. What is the proper way to pack/secure the unit for transportation? Continue reading "Transporting Sligh Grandfather clock"
Continue reading "Please Help with Sligh Grandfather clock replacement pendulum"
Continue reading "Ridgeway model 200"
Continue reading "What is the value of my Ridgeway grandfather clock"
Continue reading "Help! Trying to find clock value"
Continue reading "Howard Miller 610-698 "
Continue reading "I just got a Pulaski clock "
Continue reading "My Old Ridgeway Grandfather Curio Clock"
Continue reading "Selling Ridgeway model e3 403"
Continue reading "Need info on my Herschede 2 with Winterhalder movement"
Continue reading "Irregular hour chimes"
Continue reading "Confused about date of my Ridgeway GF Clock"
Continue reading "Looking to buy a Pulaski Keepsakes Collection Grandfather Clock"
Continue reading "Looking for information on my Williamsburg by Daneker." Edward Meyer 31 day innards? Continue reading "Edward Meyer 31 day innards?" Continue reading "Emperor Clock, Chimes sound sour!" 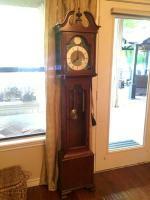 Continue reading "limited eddition #148 ridgeway grandfather clock"
Hi, I am looking at a Ridgeway GF clock for sale, model 7399. I think it was made in 1986 or 1987. What is the value of this clock in good condition? Continue reading "value of Ridgeway Model-7399"
Continue reading "How do you replace the chime rods in a Colonial grandfather clock?" Continue reading "Howard Miller model 610-341 Value"
Continue reading "Please help identify the maker of this movement"
Continue reading "Clock IS Not What It Used To Be"
Continue reading "When was my colonial clock made "
Continue reading "Senator Daneker Floor Clock"
Continue reading "Need weights and pendulum for a Sligh Model 0964-2-AN"
I have an Ambassador Model in excellent condition that I would like to sell. I can send a picture later. Continue reading "Daneker Ambassador Model "
Continue reading "HENTSCHEL GRANDFATHER CLOCK ASSEMBLY INSTRUCTIONS"
Continue reading "Blind Man's Grandfather Clock"
Have a Trend by Sligh grandfather clock, style 891WM-461. Clock is synchronized and chimes correctly on the quarter hour, half hour, 3/4 hour and hour. Continue reading "Does anyone have the same problem?"